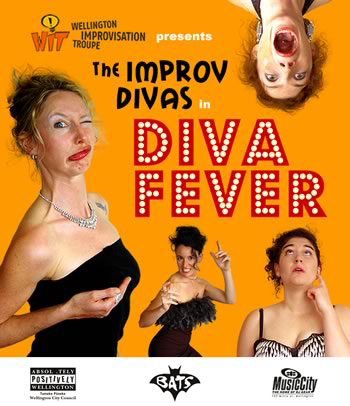 New Zealand’s all-female improvisation act the Improv Divas is back! The Improv Divas’ latest improvised comedy show Diva Fever! premieres at BATS on Thursday. Diva Fever! features five of Wellington¹s up and coming female improvisers in the cast – Danielle Hodgson, Chrissie Ainsworth, Clare Kerrison, Juliette MacDonald and Nicky Hill. The Divas are part of a growing improvised comedy scene in the capital and are part of the regularly performing Wellington Improvisation Troupe (WIT). This entry was posted in Improv Divas, past shows and tagged all female, Divas, improv, improvisation, women on January 14, 2004 by MaDmin.